A few days of heavy rain had increased the flow and added some welcome colour to my local river this week. With a mild, dry day forecast, I made my way to the weir, hoping for some decent sized roach on the bread punch, fished on the stickfloat. The river was up about a foot on its summer level, the increased pace creating waves, where it met the outfall. Set up with a 6 No 4 ali stemmed stick float to size 16 hook, I started off by putting in two egg sized balls of liquidised bread slightly upstream of my box, one down the middle, the other two feet from the bank, watching them sink and break up as they washed down stream. Guessing the depth at three feet, I ran through off the top of my 14 foot rod, seeing the float dive under half way down the swim, the rod bending into a 6 ounce chub, that ran back to the fast water, a rapid backwind of the reel cushioning the pull. This swim has a high bank and I swung the 3 metre landing net out out to collect the chub. Another 6 mm bread pellet on the hook and I was ready again, this time a roach burying the hook. I had come for the roach and this was a good start, my next trot being down the inside line, where the occasional pound-plus chub, can be found under the bush. The float dived long before reaching the bush and on contact I was convinced it was a chub, the rod bending down as the fish ran into the foam. 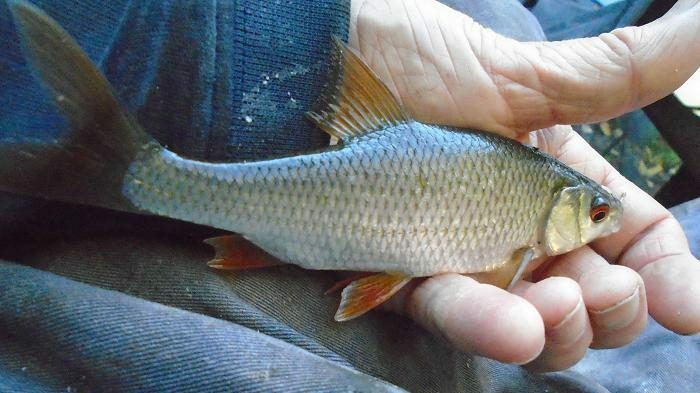 Using an open face ABU 501 reel, I lifted my line controlling index finger to release line, when the fish continued downstream into the fast water, a flash of red fins proving that it was sized roach, eventually bringing the zigzagging fish back to the net. Next cast was a repeat performance, the float diving beneath my feet on the inside and I was battling another beauty. 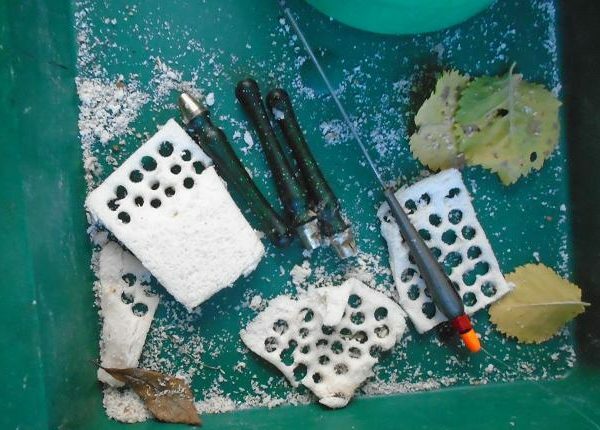 This one had black spot desease, caused by a flat worm lavae, that latch onto the skin of the fish, the fish covering the area with black pigment. The roach in this pool are often covered in the spots, which as far as I can see, do not affect the health the fish, this one being full of fight and rounded in the body. I fed a couple more balls to keep them coming, the roach taking on the run through in the pacy flow. Usually an eddy is formed, where the river meets the outfall, this being the hot spot, but today the force of the river was pushing the eddy back upstream into the tumbler and I tried a cast to the edge of the foam, watching the float travel upstream and disappear. Giving line, I paused, then struck, the rod bending round as a fish fought upstream into the weir. Keeping the rod low to avoid the bush, I held the run, reeling steadily back, the fish dropping into the flow, then diving for the base of the roots. I kept winding, seeing a big roach of about a pound pulling against the rod. It dived again and came off, the size 16 hook pulling free. Ouch! That hurt, cursing myself for being impatient. I dropped in another ball and tried again in the same spot, the float carrying upstream, dipping, then vanishing with another rod bender, this time easing the pressure and backwinding, watching a good roach fighting hard under the bank, taking my time to get the net under it. Not a pound roach, but a very nice fish all the same, the upstream eddy holding some nice fish. I hooked, then lost another stormer, that ran over to the the far side of the weir stream, before connecting me to a dead branch, shedding the hook. My next roach made it back to the net without too much fuss. 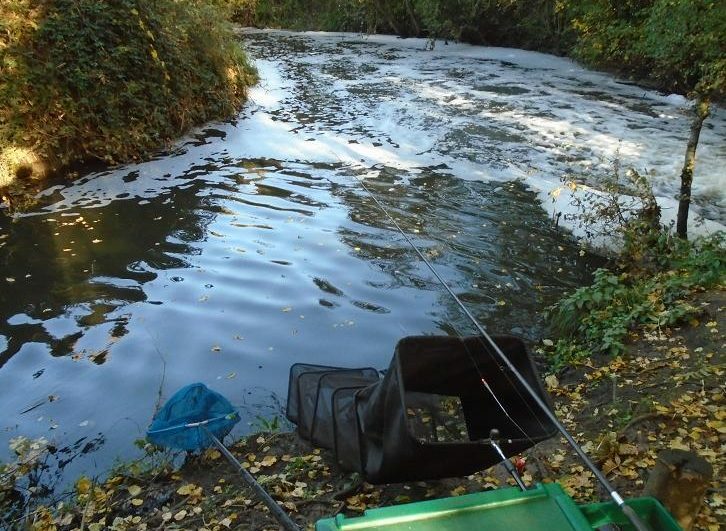 I decided to rest the weir stream to concentrate on the river, going over depth on the float by a foot, to offer a stationary bait close to the confluence. The float had just held back, when it bobbed a couple of times and slid away, lifting into a solid resistance, that slowly woke up into another hard fighting roach. This roach was about 12 oz, taking me all over the river in an effort to escape. Once again the net was out for a good fish and I leaned back to counterbalance the leverage. Looking inside its mouth as I removed the hook, I could see a grey line of silt, a sure sign that the roach were Hovering up the fine bread crumb, that was coating the bottom. Once again, the laying on technique worked immediately, the float giving a couple of bobs, before holding under with a good roach, that made straight for the fast water, as I backwound. With this one netted, it was time for a cup of tea and a sandwich, I know I could have had a couple more fish in the net in that time, but the fish were not going anywhere, while I was feeling knackered. I had fed another ball of bread before my tea, my first cast back in seeing a sail away take and the rod bending over again with yet another quality roach. I tried laying on at my feet, getting a bobbing bite, that I thought was one of the three inch chub that I had been troubled with along the edge, but no, the line went solid with the roach above. As the morning slipped into the afternoon, the bites slowed and I tried shallowing up again. I had gone up to a 7 mm punch also and now went down to a 5 mm pellet. Success, the change brought more confident bites and the catching spree continued. A small ball of feed every other fish had, the roach lined up on the edge of the fast water, easing the float into the foam, resulting in a disappearing float each time. I had only allowed myself three and a half hours fishing today, due to a family commitment, having to stop when the roach were still going strong, but this was not a match and I made the decision to stop at this last roach. Yet another clonker. 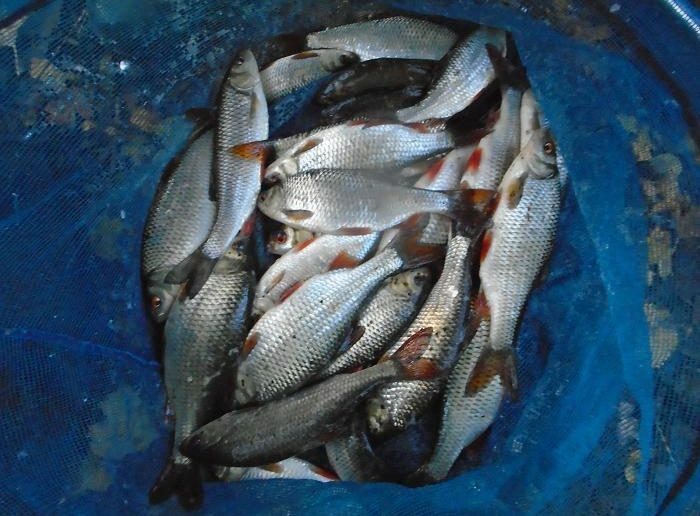 Looking at my punched bread, I could see that I had had a good session, varying the punch size and depth resulting a memorable net of roach. A quick weigh-in pushed the scales close to 9 lbs, a satisfying end to the session. It was rewarding to see that this part of the river has recovered from a devastating series of pollution events 18 months previously. Great post Ken, great to see the capacity of nature to recover.